Wayfinding includes all the ways people understand their surroundings and travel from place to place. This is more than signs – it also includes names, landmarks, conventions, maps and new media. The first two phases are now complete and the City is now undertaking a comprehensive evaluation of the pilot project. The signage for the Don Valley pilot was manufactured and installed in summer 2017. The area covered follows the Pan Am Path (Lower Don Trail), from Lake Shore Boulevard to Pottery Road, and includes Riverdale Park (East and West). 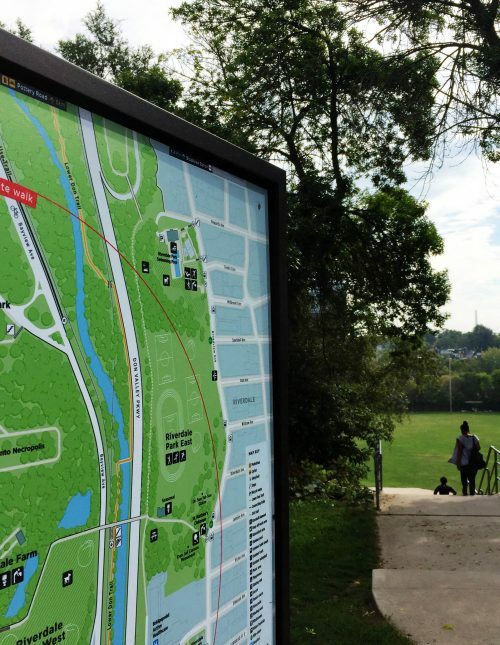 The core objective of the Toronto Parks and Trails Wayfinding Strategy is to produce a signage and information system that is consistent, accessible and predictable. It is an opportunity to reduce visual clutter in parks, and encourage the use and discovery of parks and ravines by residents and visitors. It also aims to interpret and extend the strategy and principles of the Toronto 360 Wayfinding Strategy developed by the Public Realm Section of Transportation Services Division to address the unique needs of Toronto’s park users. The Toronto Parks and Trails Wayfinding Strategy was completed in two phases. The first phase of the project created the wayfinding system framework and includes the system principles, general style and design guidelines. Phase One was completed in December 2014. The framework developed in Phase One provided the necessary tools and approach for Phase Two – design and pilot implementation. Phase Two began in January 2015, and signs were installed in September 2017, in a pilot area that includes the Lower Don Recreational Trail from Pottery Road to Lake Shore Blvd. E, and Riverdale Parks East and West. The new signage family is a modular system that allows for maximum flexibility with the aim to reduce clutter and rationalize information for parks users. 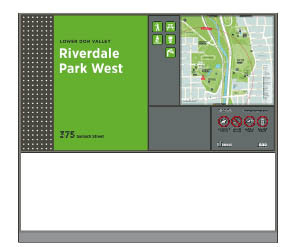 One of the key features of the signage system is the modularity of the structures information panels which are easily removed and updated to suit specific locations or if a sign structure has been vandalized. The Toronto Parks and Trails design shares many graphic principles with the TO360 system which allows users to seamlessly transition. Park signs (green) primary function is to inform users about parks and facilities, support navigation and promote exploration. Trail signs (orange) primary function is to support linear navigation in, along and out of trails, as these are often disconnected from the city with limited entry points and interrupted links.